Prevents side effects from drugs, chemicals, cigarette smoke, noise. Associated with fighting premature ageing. Reduced glutathione, commonly known as glutathione or GSH, is a tripeptide made up of L-glutamine, L-cysteine and glycine. It is ubiquitous in all living systems. However, chronic oxidative stress reduces levels of cellular glutathione and its biosynthesis is affected by dietary and/or individual biological factors - a person’s particular ability to metabolise its various precursors. ¤ Glutathione is rightly considered the most important intracellular antioxidant produced by the human body. Until now however, it has been necessary to take it either orally at high doses, or sublingually, in order to guarantee maximum absorption. Indeed, the major part of an oral dose of glutathione becomes oxidised before it can be absorbed and used by cells. ¤ S-acetyl glutathione (SAG) is a new and superior alternative to reduced glutathione. Various studies have confirmed that in this form it is better absorbed through the intestinal wall as its acetyl bond prevents oxidation and helps the molecule to pass diffusively into the cell after absorption in the intestine. It is this acetylation that prevents the breakdown of glutathione. ¤ SAG therefore enters the cells directly and once inside, it is converted into reduced glutathione by cytoplasmatic thioesterases (sulphur atoms), which removes the acetyl group. ¤ This increases both total glutathione and the percentage of reduced glutathione, which has a very positive effect on oxidative stress biomarkers. Indeed, SAG is an active antioxidant in all tissues and in supporting immune function. • play a role in boosting mitochondrial energy production and function. Mitochondria, the energy-producing powerhouses of cells, are also the primary intracellular site of oxygen consumption and source of reactive oxygen species (ROS). SAG has been shown to cross the membrane of the mitochondria, increasing the organelle’s activity and minimizing generation of ROS, thus helping to maintain mitochondrial integrity and overall health. • eliminate heavy metals (mercury, lead, cadmium…) as well as organic toxins, while maintaining blood levels of magnesium. SAG is a simpler and equally effective alternative to intravenous chelation, which until now was considered the most active way of administering glutathione. • and finally, there is growing evidence that intracellular glutathione levels in antigen-presenting cells (macrophages, for example) may influence Th1/Th2 cytokine response and promote a balanced immune reaction. In addition, due to its selective effect on cancer cells, SAG is emerging as a promising new substance for lymphoma patients, since it increases cell apoptosis. 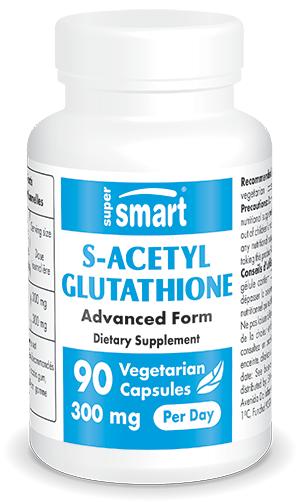 To boost the effect of SAG and restore glutathione levels, a precursor of this antioxidant is also available from the SuperSmart catalogue: N-acetyl-cysteine (NAC), a particular form of L-cysteine. Like methionine, this amino acid contains a sulphur atom and plays a role in glutathione production. Other amino acids, such as lysine and branched-amino acids (leucine, isoleucine and valine), may also be of interest for the synthesis of active molecules. SAG thus complements our other two forms of glutathione, Perlingual Gluthatione and Reduced Glutathione. It is now the most advanced and effective way of increasing levels of this essential endogenous antioxidant. Each capsule contains 100 mg S-acetyl-glutathione.